Terrorist networks have grown highly prone to the use of the internet for spreading their propaganda and recruiting followers in recent years. Although the fear of the general public of terrorist attacks certainly puts considerable pressure on policy makers, politicians also strategically use the climate of diffuse anxieties to increase the securitisation of the internet and present themselves as capable, tough leaders. The latest example of such election-motivated policy making is the proposal for a Regulation on preventing the dissemination of terrorist content online, with which the European Commission continues its trend of producing a watershed of “solutions” to terrorist propaganda on the internet. First, it creates orders issued by (undefined) national authorities to remove or disable access to illegal terrorist content within an hour. Second, competent authorities can choose to make referrals of terrorist-related potential breaches of companies’ terms of service that would be subject to the voluntary consideration of the companies themselves. Third, it legislates on (undefined) proactive measures that can lead to an authority requesting a general monitoring obligation. A major concern for the functioning and freedom of the internet is the extension of the upload filter regime the EU is currently about to introduce for copyright to terrorist content. Requiring internet companies to monitor everything we say on the web does not only have grave implications for the freedom of speech, but it also follows a dangerous path of outsourcing and privatising law enforcement. EDRi will follow the developments of the Terrorist Content Regulation closely and critically in the next months and provide crucial input to policy makers to ensure that human rights are fully respected in the proposal. 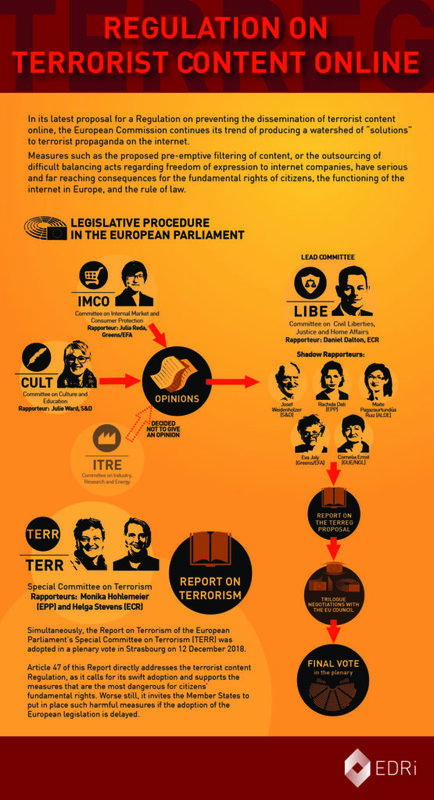 The post Terrorist Content Regulation: Document Pool appeared first on EDRi.